The Defence Ministry has accepted the recommendations of a high powered committee to make public the war records of the 1962 Sino-Indian conflict, 1965 and 1971 Indo-Pakistan war as well as experiences of the Indian army in peace-keeping role in Sri Lanka. The BJP is going to contest the coming Jammu and Kashmir Assembly elections on the twin plank of anti-terrorism and regional autonomy. The Punjab Chief Minister, Capt Amarinder Singh, today said former Chief Minister Parkash Singh Badal was trying to derive political mileage from the legal cases against him. The Chief Minister, who has returned from a foreign visit, said Mr Badal knew that the net was closing in on him. A Delhi court today remanded Sri Bhagwan Sharma, a key accused in the murder of journalist Shivani Bhatnagar, to 14 days’ judicial custody. Metropolitan Magistrate Raj Kumar Chauhan gave the order when Sri Bhagwan, who earlier was remanded to 14 days’ police custody, was produced before him upon expiry of the remanded period. The Congress got a new lease of life in Tamil Nadu today when the Tamil Maanila Congress (TMC) merged with it at a function in the presence of Congress President Sonia Gandhi. Subedar Surinder Singh of 3 Sikh regiment was today posthumously decorated with Ashok Chakra, the highest peace time gallantry award for gunning down four Pakistani mercenaries in a fierce encounter near the border town of Poonch. Forty officers and jawans of the CRPF have been awarded President’s Police Medal for distinguished Service and Police Medal for Meritorious Service on the occasion of Independence Day. President A.P.J. Abdul Kalam today presented President’s Police Medal for Distinguished Service and Police Medal for Meritorious Service to 17 officers and other personnel of the CBI. While three CBI personnel received the President’s Police Medal for Distinguished Service, 14 got the Police Medal for Meritorious Service. 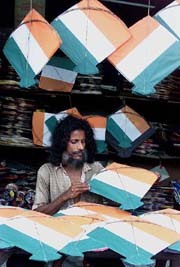 The country goes in for a splash with the Tricolour on the eve of the 55th year of Independence on August 15. Security has been beefed up in the Capital ahead of Independence Day celebrations. Large number of people throng a three-day exhibition of snakes in Bhopal, where nearly 200 varieties of snakes are on display. “The truth about what went wrong, where and why should not embarrass anyone and it is a must that we don’t repeat the mistakes of the past,” Mr Fernandes observed at a function here. 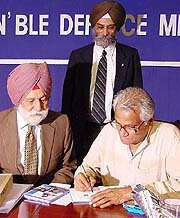 Speaking after formally releasing a biography of “Marshal of the Indian Air Force — Arjan Singh”, written by The Tribune’s Assistant Editor Roopinder Singh, the Defence Minister said national defence in India had suffered over the centuries as Indians did not care much for battle history. “If we learnt from past battle mistakes, we would not be facing such security threats as we do at present” Mr Fernandes said as he lamented that India over the years had failed to pen down the details of historic battles fought on Indian Soil. The Central Election Committee of the BJP is meeting next week to finalise the party candidates for the elections, the sources said, adding that the party would contest all seats in Jammu and Ladakh region, while in the valley it would field enough candidates to register its presence. The main campaign plank is going to be fight against terrorism and regional councils for Jammu and Ladakh. The party is of the strong view that the demand for autonomy as formulated by the National Conference and other political groups has to be answered with the devolution of power which should also mean shifting of power from Srinagar to Jammu and Ladakh . General Musharraf’s address to the nation on the occasion of Pakistan’s Independence Day is a challenge to the civilised world which is fighting the menace of global terrorism and his nervousness about the democratic procedure in Jammu and Kashmir is obvious,” party spokesman Sunil Shastri told newspersons here. Mr Shastri said the Pakistan President should concentrate on holding elections in his country rather than be concerned about the Assembly poll in Jammu and Kashmir. The Punjab Chief Minister, Capt Amarinder Singh, today said former Chief Minister Parkash Singh Badal was trying to derive political mileage from the legal cases against him. The Chief Minister, who has returned from a foreign visit, said Mr Badal knew that the net was closing in on him. The state government would continue to persue cases of corruption to their logical conclusion, he said. Asserting that he stood by his earlier statements, the Chief Minister said investigations into the assets of Mr Badal was continuing. However, no disclosures would be made till the investigations are complete, he said. In a statement issued here yesterday, Punjab Congress chief H.S. Hanspal had said that Mr Badal was resorting to “diversionary tactics” to divert attention from the charges of corruption being faced by him. He said Mr Badal was unable to face the charges against him politically. The PCC chief said allegations of misappropriation were levelled by the Congress even while the party was in Opposition but Mr Badal had been “quiet” for the past eight months. “Now that dharnas being staged by Mr Badal are not succeeding and there is fear of investigations catching up with him, Mr Badal has taken the legal course,” Mr Hanspal said. Several Punjab ministers and MLAs have also taken exception to Mr Badal’s remarks about the Congress government not lasting its full term of five years, “If Mr Badal has the courage to face the popularity of the Congress government, he should face it politically and should not take shelter in other fields. All the MLAs, ministers and the Congress party is solidly behind Capt Amarinder Singh who has emerged as strong leader,” they said in a joint statement. Apart from Mr Hanspal, the signatories to the statement included Punjab ministers Chaudhry Jagjit Singh, Ashwani Sekri, Ramesh Dogra and Partap Singh Bajwa; Mr Surinder Dawar, Harjinder S. Thekadar Jugal Kishore and Dr Rajkumar, all MLAs and Mr R.S. Bhardwaj, state Planning Board Deputy chairperson. In a separate statement, senior Punjab Congress leader Sant Ram Singla, former MP, said the Congress government would continue its drive against corruption and nepotism. Describing Mr Badal’s tenure “as the darkest in the history of Punjab,” Mr Singla said the Akali Dal (Badal) had been rejected by the people of Punjab and Mr Badal was adopting “various tactics” to keep his party united. He said Capt Amarinder Singh’s crusade against corruption had been widely welcomed and the state government was trying to mobilise resources to put the economy back on the rails. Maintaining that the Amarinder Singh government had not launched a witch-hunt against its political adversaries, Mr Singla recalled the treatment meted to Congress workers after Mr Badal came to power in 1977. He said false cases were registered against several Congress leaders following the party’s Mattaur session. A Delhi court today remanded Sri Bhagwan Sharma, a key accused in the murder of journalist Shivani Bhatnagar, to 14 days’ judicial custody. Metropolitan Magistrate Raj Kumar Chauhan gave the order when Sri Bhagwan, who earlier was remanded to 14 days’ police custody, was produced before him upon expiry of the remanded period. The court also allowed the accused counsel Surat Singh “to have an interview with the accused in the lock-up at the Karkarduma court complex for 15 minutes”. Surinder Singh, who made the supreme sacrifice in the battle near Pir Badesar, is the lone recipient of Ashok Chakra, the equivalent of Param Vir Chakra, in the Independence Day armed forces honours list this year. Although Indian and Pakistani troops have been at a tense standoff all along the international border and the Line of Control for the past eight months with almost daily exchange of artillery and small arms fire, the Army has so far not declared “Operation Parakarma” as a battle with the enemy. Thus, no war decorations have been awarded. Major Ushnisha Jaitlay of 3/11 Gorkha Rifles, Naib Subedar Ishwar Singh of 5 Parachute Regiment and Naib Subedar Deve Bahadur Thapa of 1/4 Gorkha Rifles have each been honoured with Kirti Chakra, the second highest peacetime award, for exemplary bravery in flushing out militants in operations in Jammu and Kashmir. Major Jaitlay and Naib Subedar Thapa will also get the award posthumously. A total of 272 officers and jawans have been decorated in the honours list, which includes 33 Shaurya Chakras, 4 Bar to Sena medals, 221 Sena medals, 7 Nao Sena medals, 5 Vayu Sena medals and 4 mention in despatches. Of the 33 recipients of Shaurya Chakra, six have been awarded posthumously, most of them for the ongoing anti-militancy drive in Jammu and Kashmir. The Shaurya Chakra winners includes a civilian, Bachittar Singh, of the Village Defence Council from militancy-infested Mahore region near Udhampur, in Jammu and Kashmir. Four officers — Col Ramesh Singh Chauhan of the Army Aviation, Major Vikrant Singh of Mechanised Infantry, Capt Gurmeet Singh of 30 Rashtriya Rifles and Capt Girish Upadhaya of Assam Rifles — have the rare honour of being awarded Sena Medal for the second time. 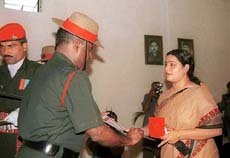 President’s police medal for distinguished service:- P.C. Joshi, IGP (Special Sector); J.S. Bisht, DIGP, Durgapur; L.R.Sidhra, Commandant 55 Battalion; and M.S. Negi, Comdt. Dte, Genl. The following is the list of the recipients: President’s Police Medal for Distinguished Service: G.N. Gupta, Addl SP, SIC-III, New Delhi; M.S. Sundrarajan, DSP, ACB, Chennai; and Rajender Singh, Head Constable, SU, New Delhi.